Lazara Morales-Cespedes is a Solvay High School senior who came to the area from Cuba, and has been living in the United States for about two years. Since her arrival, Lazara has been chosen to participate in the Puerto Rican Hispanic Youth Leadership Institute (PRHYLI) in both her junior and senior years. Students who participate in the institute are required to attend six sessions of leadership training during the day. Then, some are chosen to attend a three day conference in Albany, where they meet with legislative representatives and participate in more leadership events. 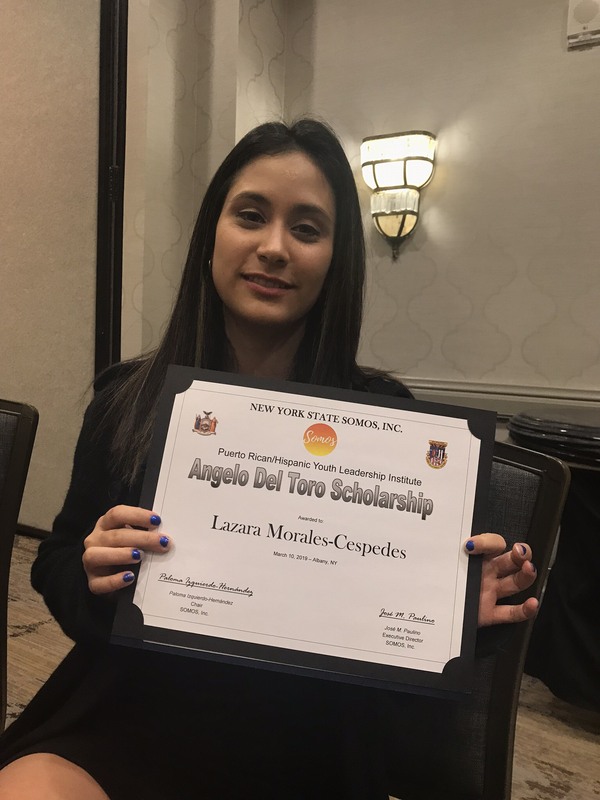 This year, Lazara was chosen to attend the conference, where she was awarded the Angelo Del Toro Scholarship! This scholarship will provide her with $1,200 to attend a college of her choice. We congratulate Lazara on this tremendous achievement, and for her significant contributions to this year's leadership institute!